After 15 years at Philadelphia's 98.1 WOGL, 'The Breakfast Club' co-host Frank Lewis will be leaving the station, marking the latest in a series of departures from the CBS station. Lewis signaled his exit from the station Tuesday with a Facebook post displaying a full pint of Guinness, which was met with outpouring of support from longtime fans. 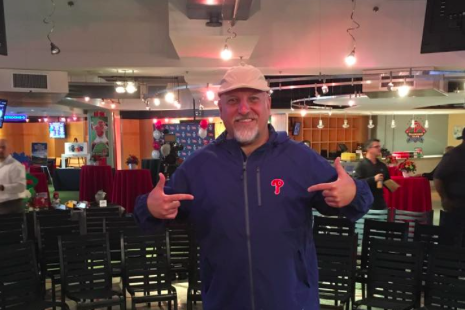 WOGL could not immediately be reached for comment on Lewis' status at the station, but the radio personality confirmed to Philly.com that he was let go. His WOGL bio page has also been taken down. Former "Breakfast Club" co-host Valerie Knight was let go from WOGL last December, followed by co-host Bill Zimpfer in April. The station's changes, including the recent exits of Rockin' Ron Cade and Cadillac Jack Seville, come amid a merger between CBS Radio and Entercom Communications Corp.
Lone host Marilyn Russell, who replaced Knight, will continue at the morning show with hits from the 70's, 80's and 90's.